The remote and the wall switch play an important role in the garage system. Essentially, they work like a radio transmitter. Both send signals to the opener and it activates a relay that starts the motor. A lot of things might cause the remote control or wall switch to malfunction. The most common problem is a burnt circuit breaker. Luckily, you don't have to worry about these problems as our technicians are well equipped to handle the situation for you. First, they'll diagnose the issue, and then repair the problematic component. How Tense Are Your Springs? Finding the root problem of your springs is more complicated than it seems. There are two different springs commonly used in overhead doors – torsion & extension -, either one or both might need tightening, loosening or replacing at one point. Springs hold a lot of tension allowing the door to open and close easily. If tampered with, the door may fall down and crush whatever is in its path. Luckily, our technicians are highly skilled when it comes to repairing and replacing springs. 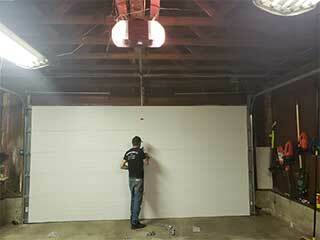 Your garage door is built in such a way that it aligns with your track on both sides. On either side of the door, your safety sensors are designed to detect when something is in the path of the door. To function properly, the sensors require a clear line between them so that the door can smoothly close all the way down. If the electronic eyes are misaligned, then this clear line will become blocked and the door will fail to close all the way. Our technicians can handle anything from adjusting the safety sensors to replacing damage rollers and will do their best to repair your door quickly when it's an emergency. Feel free to contact our team at the Garage Door Repair Newberg, OR for professional assistance – we're here to help! We’re proud to provide fast and excellent service to our customers so their garage door woes will be taken care of before they know it! We offer a variety of professional services such as maintenance, installation, and repairs. If your door has been acting up lately, don’t wait! Just give our team a call or browse our site online today. Thank you for choosing our company! Feel free to browse our website for more information in the meantime. Our team at Garage Door Repair Newberg is at your service any time!